Last week was cold and rainy. I don’t think the sun came out much at all. Plus there was the time change which meant I left for work in the dark and came home in the dark. This signals two things to me: A) I need to get out my Happy Light, and B) I need a comfort food soup to slurp. I got this recipe out of my Better Homes and Gardens Cookbook. I like this recipe because it’s easy and quick, but also because my kids will eat the parts of it separate from the soup. For instance I boil a few extra noodles to leave out of the soup for the boys. They will also eat some of the veggies if I leave them out of the soup. Everyone was happy and Eddie even declared it a “delicious meal!” when I served it. If the four-year old thinks it’s delicious, you know you’ve won dinner time. In a 4-quart Dutch oven combine the beef broth, kidney beans, garbanzo beans, undrained tomatoes, veggie juice, tomato paste, sugar, and Italian seasoning. Bring to a boil. Add mixed veggies and reduce heat. Let simmer covered for about 10 minutes or until veggies are tender. Stir in the cooked pasta and the spinach; heat through. Serve with a little parmesan cheese sprinkled on top. The recipe makes a LOT, so next time (yes, there will be a next time), I will probably only make half a batch. I like leftovers as much as the next guy, but it made a LOT of soup for two people. I don’t know about you, but when the temperature dips below 65 degrees, I start thinking about warm comfort food. And one of my favorite comfort foods are soup and chili. Oh man, I am thinking about how yummy it smells to have soup plupping on the stove, and how cozy my tummy feels when I’ve finished a cup or bowl. Mmmm! Since Cortney and I love a good bowl of warm deliciousness, I decided to try to make a new soup/chili once a week this fall. And guess what, I’m going to share them with you! 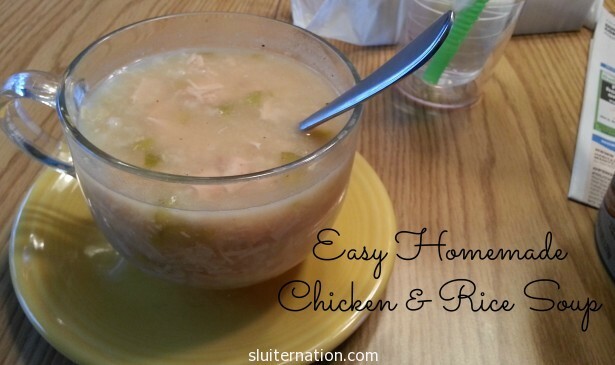 The first soup–and the one that made me want to eat soup weekly–is my mom’s homemade chicken and rice soup. 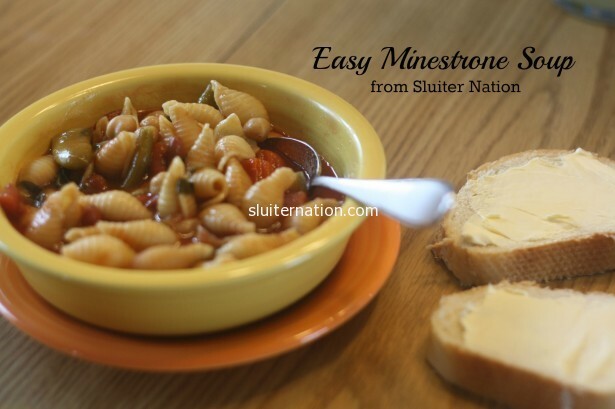 It’s a soup-er easy recipe (see what I did there? ), and very soul-warming. I made it because I was craving my childhood. I wanted the warm safety of my parents’ house and specifically the predictability of a warm, home-cooked meal on the table every night. Just the smell of this soup calms down all the hurt in my heart and hushed the buzzing in my head. I hope it works this magic for you too. put it all together in a big pot on the stove and bring it to a low boil. Reduce heat and let it "plup" for about an hour. 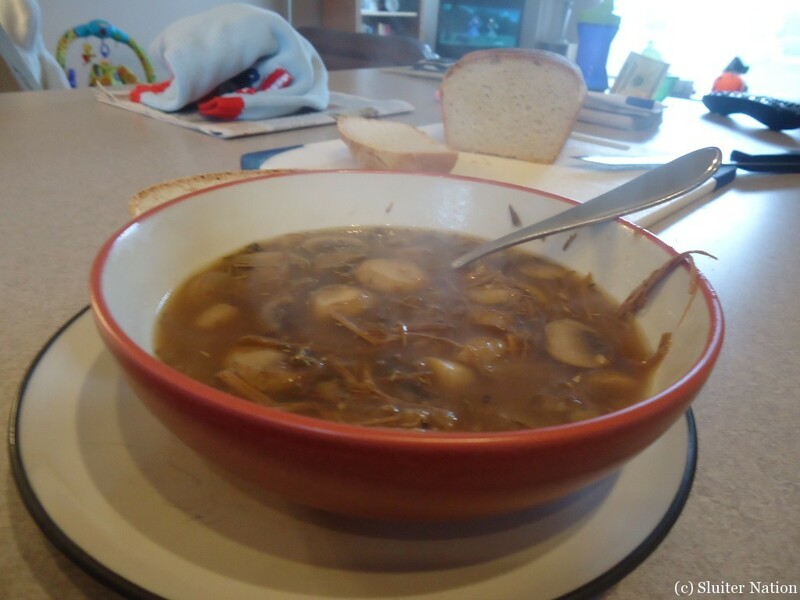 serve with crackers or bread or whatever you love with soup! Enjoy! 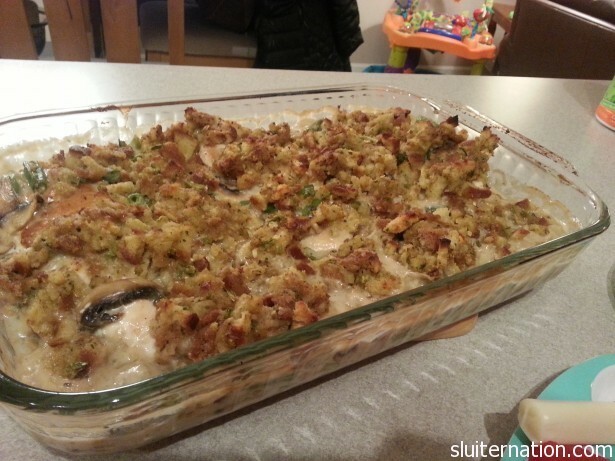 Want more recipes that I’ve posted before? This is my Veggie Beef Soup recipe (also from my mom) and this is my White Chicken Chili recipe (adapted from a recipe by my aunt). 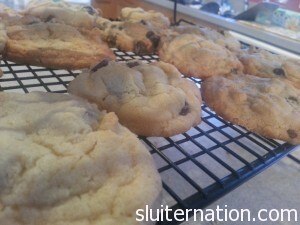 I am pretty sure zero people out there need a recipe for chocolate chip cookies. I mean, there’s one on the bag of chocolate chips. But I just can’t help sharing this recipe. When I bite into these, it’s like I’m eating my childhood. Wait. Ok, let’s try that again. You know how sounds and scents can bring you right back to a place? One bite of these cookies brings me back to being a kid. 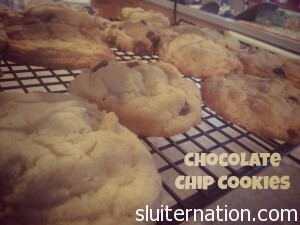 From helping my mom mix in the chocolate chips to licking the beaters (yup, there’s raw egg in there. We live dangerously). They remind me of coming home from somewhere and seeing a bunch cooling on a cut up brown paper bag (my mom had a cooling rack. She hated it and gave it to me. She still cuts up the brown paper bags from the grocery store to use for cooling treats). My mom has been making these bad boys my whole life; it was the first recipe I knew I had to take with me when I moved out 13 years ago. I mean, who doesn’t love the sweet taste of their youth? Then mix in the flour, soda, salt, and cream of tarter. I like to add a bit of cinnamon here too. Lastly fold in the chocolate chips. Take spoonfuls of the dough and drop about an inch or so apart on a baking pan. Every time I eat one of these, I am brought back to being a little kid. And because Cort has a sweet tooth (mostly for chocolate), he likes to make these often. What treat reoccurs often in your house? Or what treat reminds you of your childhood? put the chicken in the pot, yo. I have way more standby meals for the colder Michigan months than in the warm, sunny months. Seriously, I am like the queen of comfort foods this time of year. Admittedly we eat a lot of crock pot meals. They are easy for this working parent family. I throw it together the night before, Cort starts it before leaving for daycare drop-off/work in the morning, and we enjoy a tasty meal as a family in the evening. 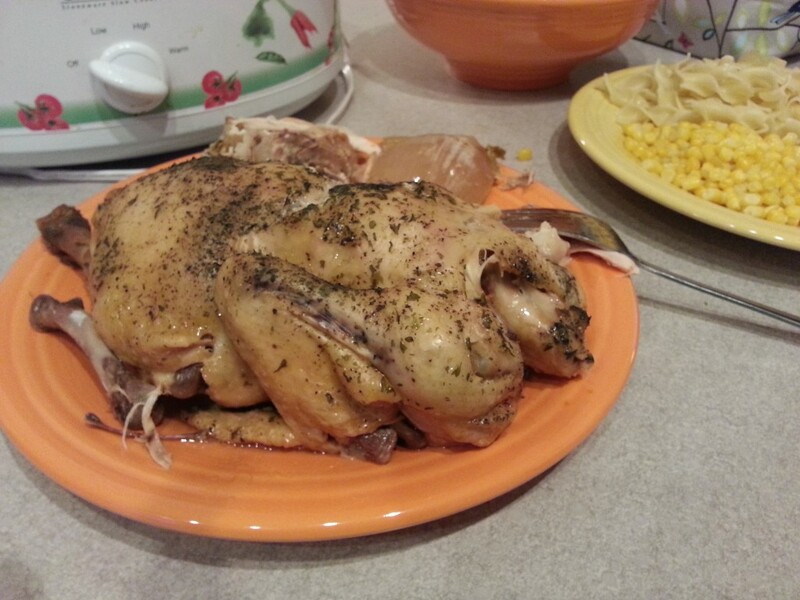 I have made almost every kind of meat I can think of (other than fish…can you do fish in the crock pot? That seams nasty), but one of our family faves is from a recipe I found shoved in a crock pot book that is probably older than I am in my mom’s cupboard. It’s just called “Chickin in a Pot” and it’s so easy! I served it with noodles and corn because it’s what was in the house, but really you could do anything with it! layer the bottom of the crock pot with chopped carrots, celery, and onion. Place in the crock pot on low for 8-10 hours. (I always do 8 hours and it comes out moist and yum). 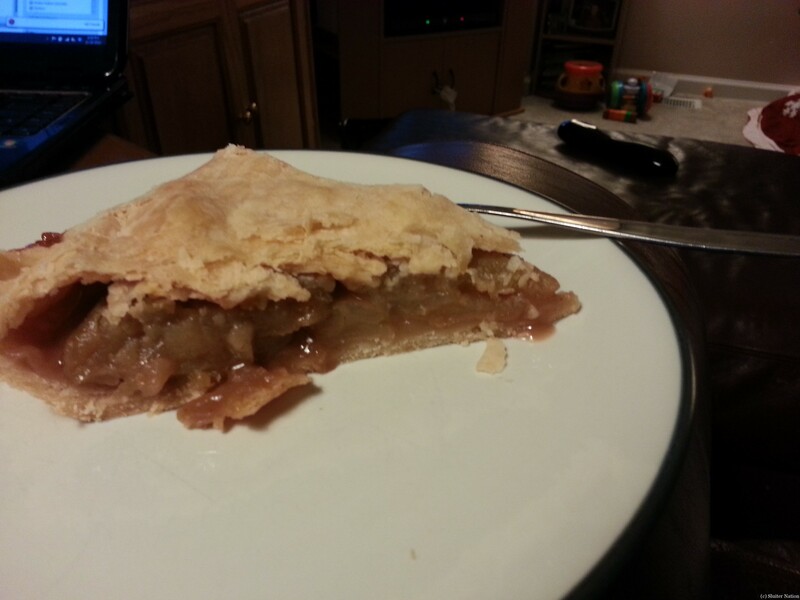 I will be honest…baking pies is easy as, well, pie. Seriously. The saying came from somewhere and I’m going to go with the fact that baking pies is really not as hard as some people think. 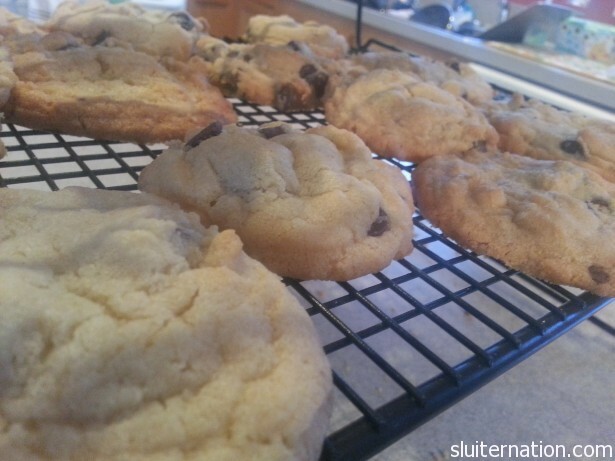 ignore the cookies in the background…those have nothing to do with the pie. But they have ALL to do with Eddie and me craving cookies. Ok, usually I use Ida Reds, but this year I went with Granny Smith Apples because I needed an apple with a bit more…tart to it. You’ll see why as we go. So first, peel and slice the apples. I usually put them in the pie plate so I can make sure I have enough to fill the pie. Then I dump them into a big bowl with about a tablespoon or so of lemon juice. Next, in a mediumish sized bowl, mix up 3/4 cup of sugar, 2 Tablespoons of flour, 1/2 teaspoon of cinnamon, and just a pinch of nutmeg. Once that is all mixed together, pour it over the apples and sort of mix it around/toss it like a salad until all the pieces are covered. Then set it to the side. Now it’s time for the crust. yes, I am that lady who put the dough kneader on the bridal registry and actually uses it. For those of you who believe crust-making is hard, I’m about to blow your mind. In a big bowl, take that dough-kneader thing (or a fork…or you hands) and whisk together 2 1/4 cups of flour and just under a teaspoon (so like, maybe 3/4 teaspoon). Then add 2/3 cup of either butter or Crisco. I find Crisco a bit easier to work with since it’s already soft, but as far as your health goes (which I am assuming you are not paying attention to if you are making a pie with almost a cup of sugar in it), butter is better for you because it’s natural. Anyway, I busted out the Crisco. You take you kneader (or fork or hands) and work the Crisco in until you get little balls about the size of a pea. Now, you are ready to add the water. 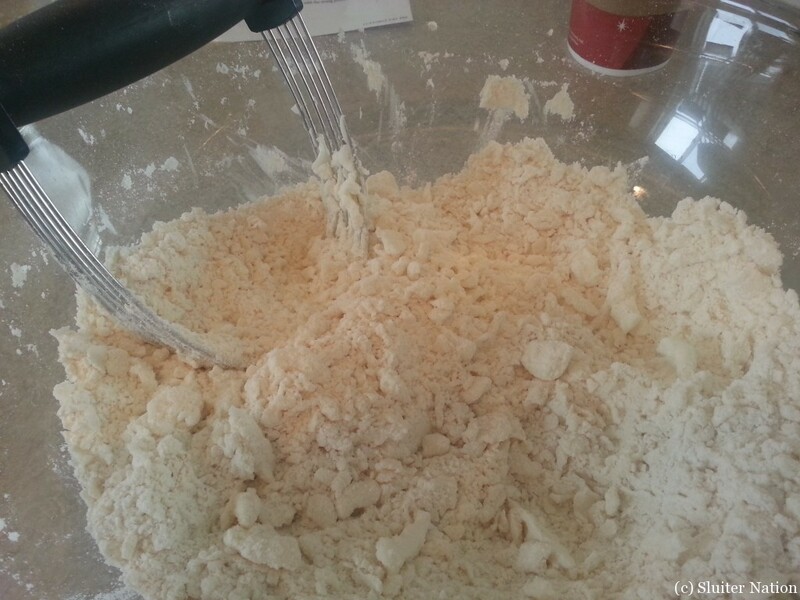 The key to this is to add it one or two Tablespoons at a time because you don’t want the dough to get too wet. So this is what I do: a couple tablespoons and then I use a fork to mix the dry with the water until it’s just moist. I want it to all stick together (no crumbs in the bottom of the bowl), but I don’t want wet slimy dough either. So I try to get as much moistened with each addition of water as I can. I think I used about 9 Tablespoons total on this pie adding two at a time until I got up to six and then adding one at a time more after that. You should be able to pick up a nice ball of dough. Split it in half, and put one ball of it onto a lightly dusted surface and roll it out as square/round as you can. 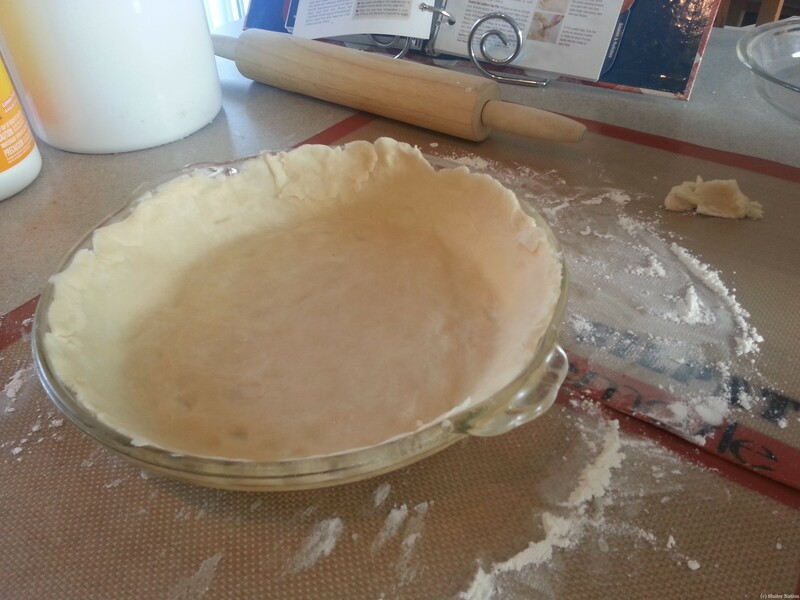 Then roll it around the pin and transfer it to your lightly greased pie plate. Push the dough so it is in all the crannies of the pie plate and so that it goes right up to the top (with maybe a little hanging over, but I usually compensate for that with the top crust). Now, this is when you could put your apples in. But this year, I decided to whip up a quick caramel mix first and spread that all over the bottom of the crust. Which is why I went with Granny Smiths. They are a better apple to have caramel with. Mmm! 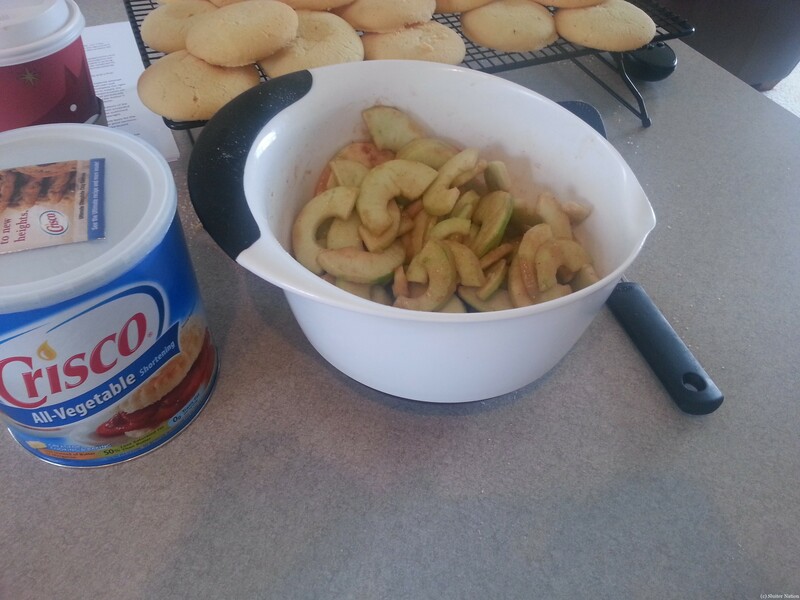 So first caramel and THEN apples. But I don’t dump my apples in because then all the juices go in there too. Which SEEMS like a good idea, until those juices become steam and puff up your top pie crust and when it cools it deflates and looks sad. Or it boils over all over your oven. So instead, I pick out my apples from the bowl by hand so all the juice stays in the bottom (ps, because they have been sitting there, all the extra juice as oozed out to the bottom of the bowl. Some people put the apples in a strainer over the bowl so they don’t have to hand pick the apples out, but I am not that smart). Hand-placing the apples also ensures that they will all be lying flat. as you can see there is still some peel left on my apples. My peeler/slicer is not perfect and I am too lazy to fix the slices. now you can roll out the top crust and place it over the pie. Pinch the top crust with the bottom to make sure it is sealed. Then you can either poke some holes in the top with a fork, or cut some slits in the top. Either way, steam needs to be able to escape or you will have apple pie all over your oven. 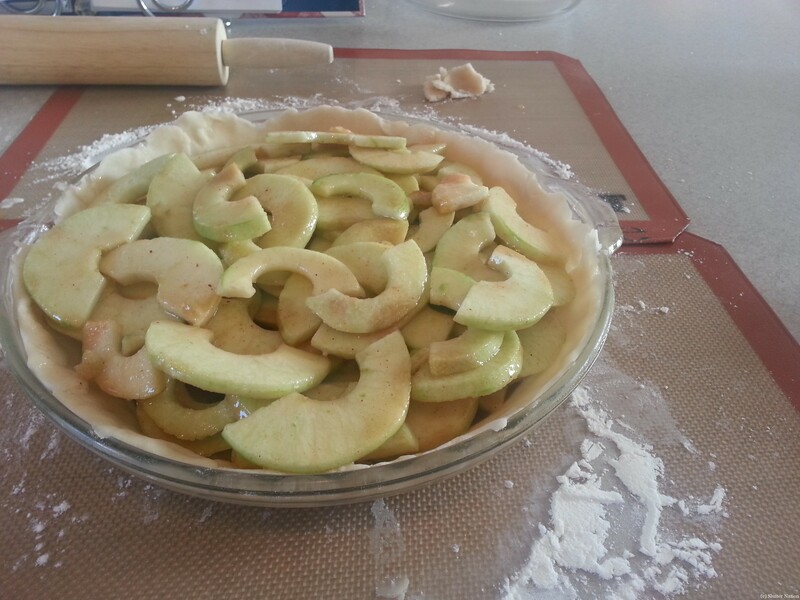 I also place the pie on an old jellyroll pan (or cookie sheet) just in case there is any juice drippage. Nobody wants that burnt stank in their oven. 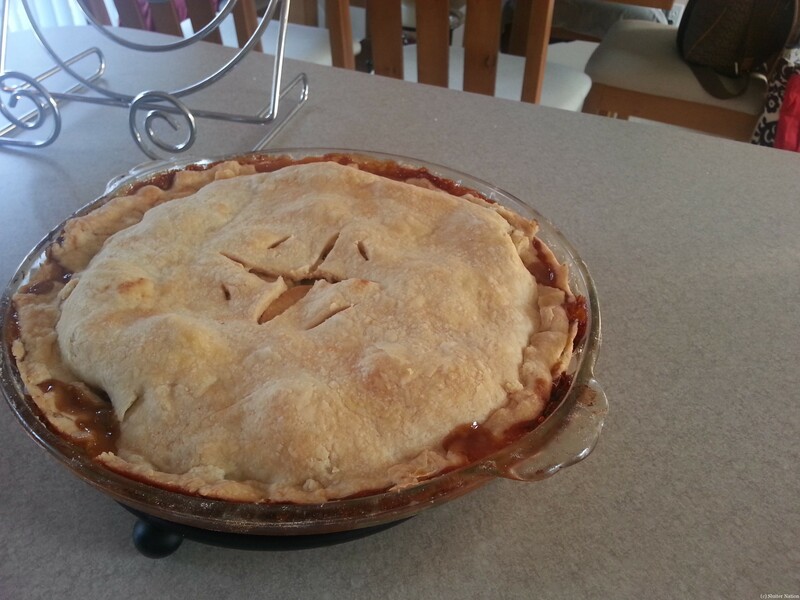 I bake this pie for an hour at 375 degrees F.
Then let it cool on a wire rack or, like I have here, a slotted trivet. It’s best served warm with a bit hunk of Hudsonville Vanilla Ice Cream plopped on top, but I can eat this pie for DAYS. You know, if it lasts that long. What was your favorite dish this Thanksgiving? Or ever? *Pie recipe mostly from my Better Homes and Gardens Cook Book 12th Edition. Growing up, both Cort and I had moms who were mostly stay at home and able to put a home-cooked meal on the table during the week. I say “mostly at home” because they both worked part time jobs here and there, but for the most part, they were home through our young growing up years. By the time my mom was working full-time, I was old enough to read a note that said, “put ham in the oven at 350 at 4:30” and actually do it. So even through high school, my mom always made sure that the five of us had a hot meal Mon-Fri. The meals she made us were familiar. There was a rotation of meals that regularly graced the kitchen table and very seldom was it that a new recipe was tried. Meatloaf (ick), chicken (yum), ham (ick), lasagna (yum), some sort of meat my mom referred to as “cube steak” (super ick), steak on the grill (yum), the list goes on. Some of those meals I could have lived without ever eating again (boiled hot dogs? Blech), but some felt like home (homemade veggie beef soup with homemade giant cinnamon rolls). I remember thinking we were so weird to be sitting down as a family five nights a week at five o’clock on the dot. None of my friends did this. In fact, some of their mothers didn’t even cook much. Now, though, I realize why those family dinners are so great. And it makes me even more happy that I can put together meals for our family a few nights a week. I don’t have time to make anything that takes more than 45-30 minutes to do after work, which means that lately I have become a giant fan of make ahead meals and my crock pot. Because my life is so different than my mom’s was when she was a newish mom, I haven’t found my “rotation” of meals yet. There are somethings that I know will get a YAY from both Cort and Eddie (pretty much anything with noodles and sauce), and of course there are things that Eddie will only eat the required “one taste” of just to be able to be excused from the table before bedtime. 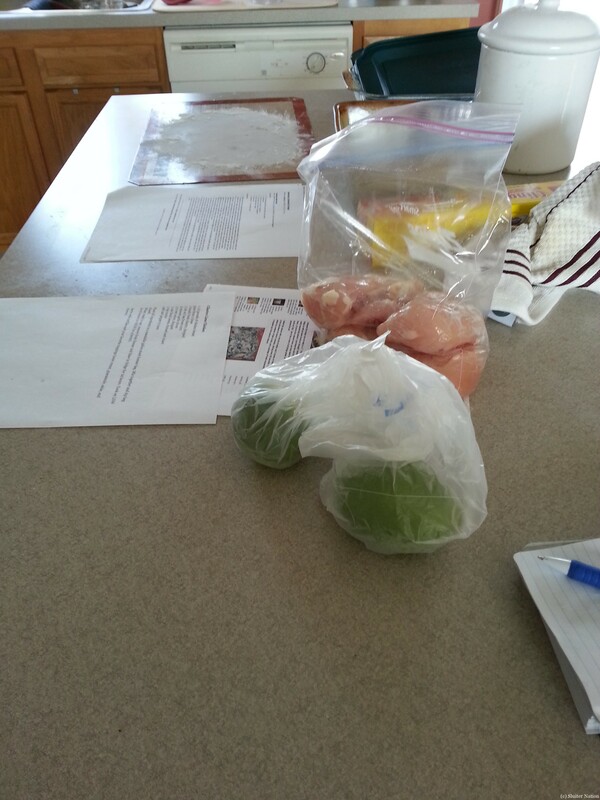 I love that I enjoy being in the kitchen and making nutritious meals for my family. Sometimes I wonder if my kids will come home from college or come over with their families for dinner and request certain dishes from their youth. 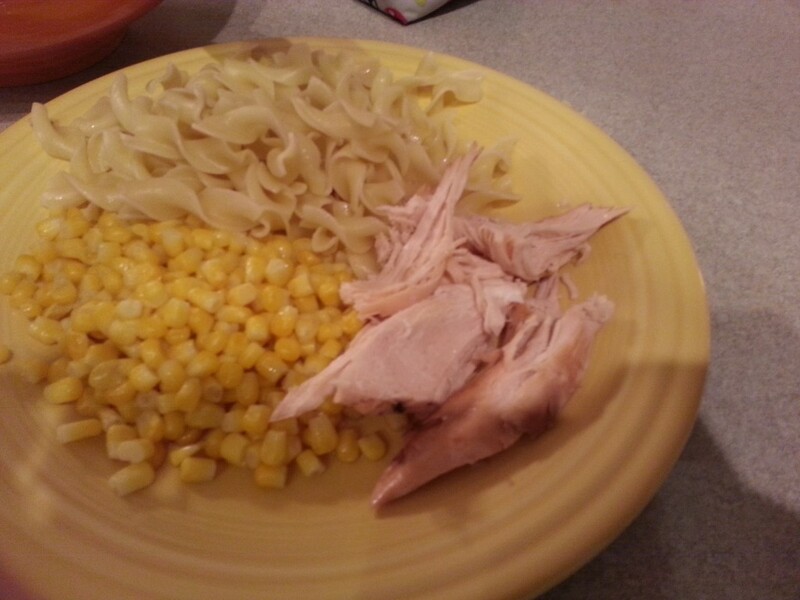 I know sometimes the meals I make are an attempt to grasp something from my kidhood. I make my mom’s veggie or chicken soup when I need comfort. I make her lasagna when I want to see happy, full family members. I make cheesy potatoes when I want to remember Sundays at my grandma’s house. Sometimes I wonder if, since this blog is a record for my children, I should include some of those recipes here. I’ve listed a few things on occasion that we have enjoyed. And of course I shared the Veggie Soup recipe and my YUM meatloaf recipe (it is truly yummy…it actually converted me to a zero tolerance meatloaf snob into a lover of meat in loaf form). I am not a food blogger. Not even close. I don’t know how to take awesome pictures of food or make my posts “pinnable”. In fact, that doesn’t matter to me. But keeping certain foods we love on record seems like a good idea. I mean, the veggie soup recipe is not even really a recipe. I wrote it down, but usually it’s just throwing stuff in a pot. But without writing it down, it would be lost with my mom and me. One of my motherly talents is feeding my people. On Sunday I was a big braggy pants over on instagram (go follow me! I’m ksluiter, naturally.) that I had not only done all the grocery shopping for the week, but that I was meal prepping for the entire week too. Thanks to a little thing called pinterest, I had looked up 3 meals that would get us through the week–most of which I could make on Sunday. This is my favorite way to organize meals for the week: do the grocery shopping myself on Saturday (after I clean out the fridge), and then do the cooking during nap on Sunday. Unfortunately, this school year has been so busy, this was the first week since August that I could pull off this plan. And I took full advantage by tweeting and instagramming my progress! After people were all curious and wanting links to the pins, I decided to put it all in one place for you…here! recipes out, 100 things going at once. 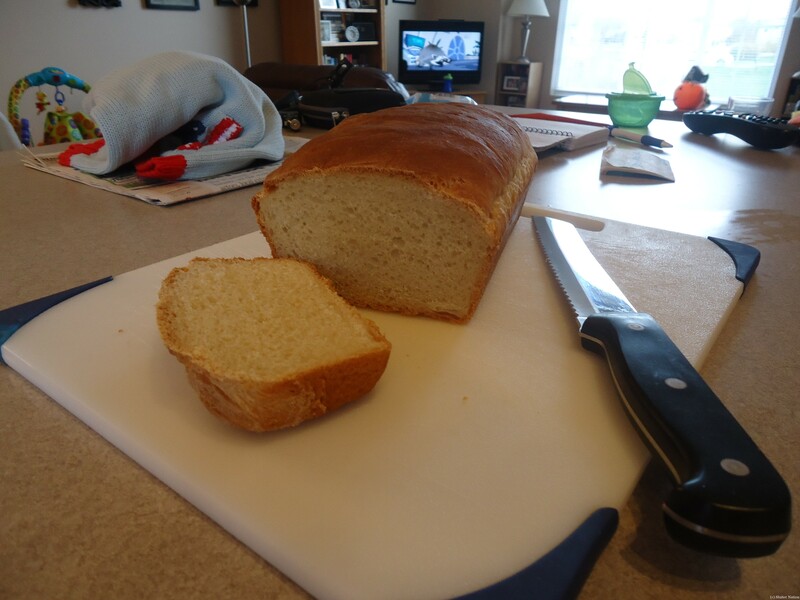 Well, on Sunday I baked this yummy bread. I baked it to go with a Pot Roast Mushroom Soup that I made Monday when I got home from work. I made a roast the week before, and in an attempt to use it before it needed to be thrown out, I made soup. The soup was Ok, but it had too much thyme for my liking and not enough…I don’t know. Something. I added salt and pepper and I still felt like it was missing something. Just a tad too bland. It also wasn’t as hearty as I was hoping. It’s a good thing I made the bread to go with it, because on it’s own it didn’t fill us up. But it would have been a great starter to a meal or with a nice Club Sandwich or maybe a BLT. 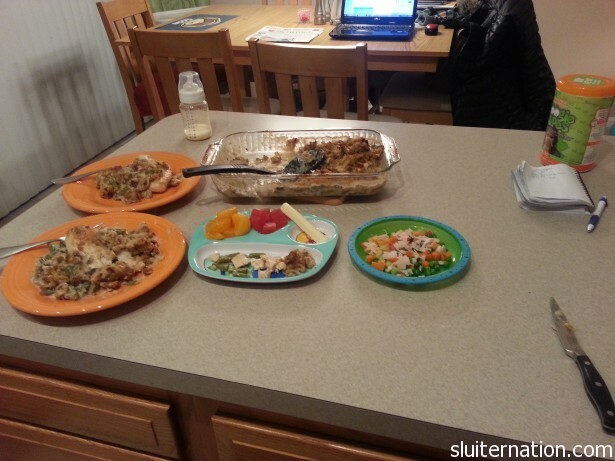 Tuesday’s dinner was much more filling…. 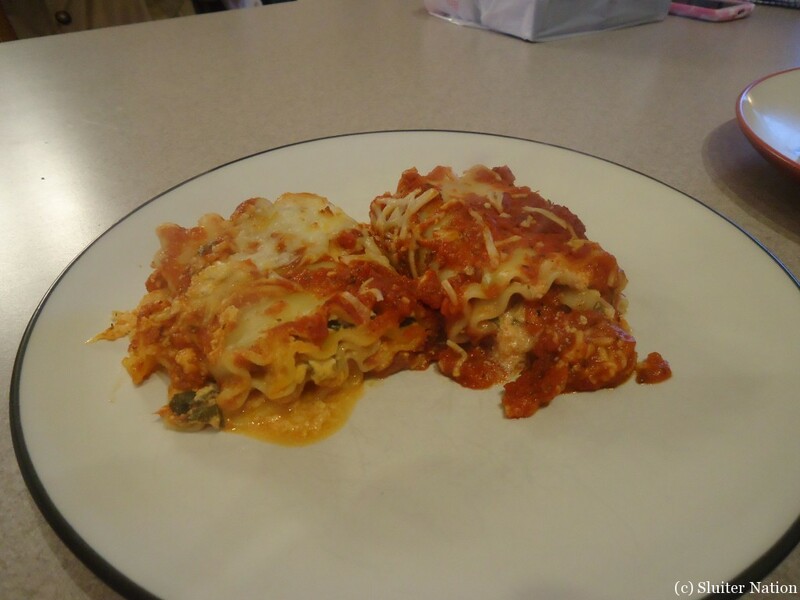 I put together these Spinach Lasagna Rolls completely on Sunday and stuck the whole pan in the fridge until Tuesday. When I got home from work Tuesday, I popped them in the oven at 350 for about 45 minutes and Ta Da! Dinner! (and delicious as left overs, I must say). For Wednesday I prepped a crock pot meal. 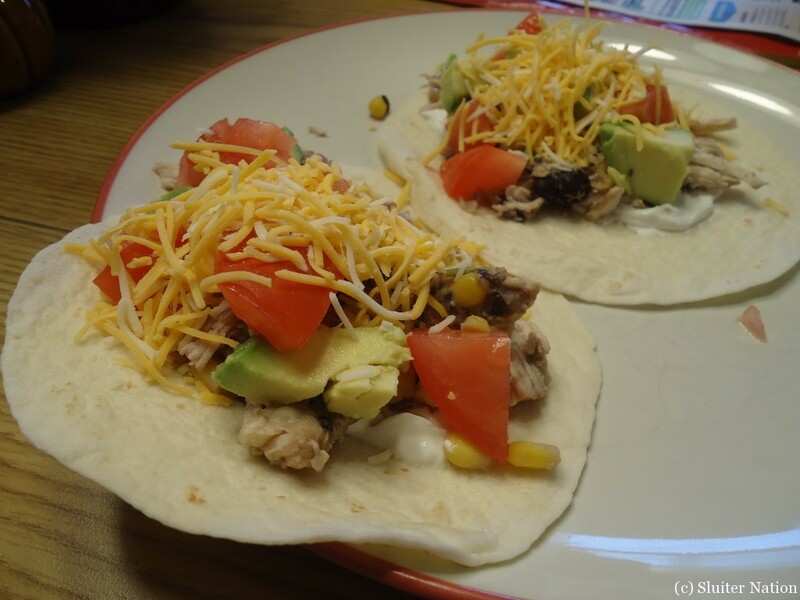 Chicken tacos for the win! I used a Cilantro Lime Chicken meal that can actually be frozen and used waaay later, but I just tossed the whole thing in a gallon zip-loc and threw it in the fridge for a couple days. On Wednesday I dumped the contents into the crock pot before work in the morning. When I got home, all we had to do was cut up the tomatoes and avocados for the toppings and shred the chicken and boom! Easy, quick pre-trick or treating meal! So three wins and a “meh” from pinterest this week. The best part to me is that I was able to use almost all fresh, real ingredients. So I know each meal was healthy for my family. I’ve got my eye on a few other things I would like to try next week, so if you enjoy this post, maybe I’ll do another one. Or not. I have to be honest, my blogging is sporadic at best lately. But I thought it should be documented that I DID COOK during this time in my life. I’m happy to say that Eddie tried each of these things. The lasagna was his favorite, although he gave the spinach the stink eye and did not seem to believe me that it would give him big muscles. But he did try it, so that was a win. I have to give Eddie credit. He will always at least try one bite of everything on his plate. Sometimes he likes it and eats more. Otherwise he pulls a face and about gags it out, but he always tries it. And that is all we ask in our house: try one bite, and then if you don’t like it, don’t eat it. Most nights plates were cleared this week, so yay! Cooking win!